Developer Dave McCormack worked with Virginia Community Capital (VCC) to fund Trapezium Brewing Company. 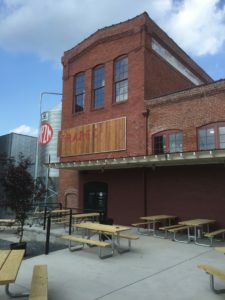 The brewery creates a lively, vibrant gathering place that brings new life to a vacant building, attracts residents and visitors to Old Towne Petersburg while creating jobs and revenue for the city. The projects VCC backs are sometimes considered “too complicated” from the broader financial community. VCC funded McCormack’s Trapezium Brewing Company with several other financial and government partners. As a Community Development Financial Institution (CDFI), VCC can support projects like McCormack’s because they align with VCC’s mission to create jobs, energize places, and foster an enhanced quality of life. Trapezium has been called an architectural marvel as part of a complex built in the 1870’s. It occupies the former home of City Ice and Coal. The 30-barrel brew system, the 150-seat taproom with a balcony overlooking the main floor and a pizza kitchen has created a sensation bigger than anyone expected. Trapezium now sells its four core beers across Virginia and into North Carolina. Owner and developer, Dave McCormack, calls Trapezium a “game changer for the area” and credits VCC with helping him bring his vision to life. Trapezium has brought 24 jobs to the community.